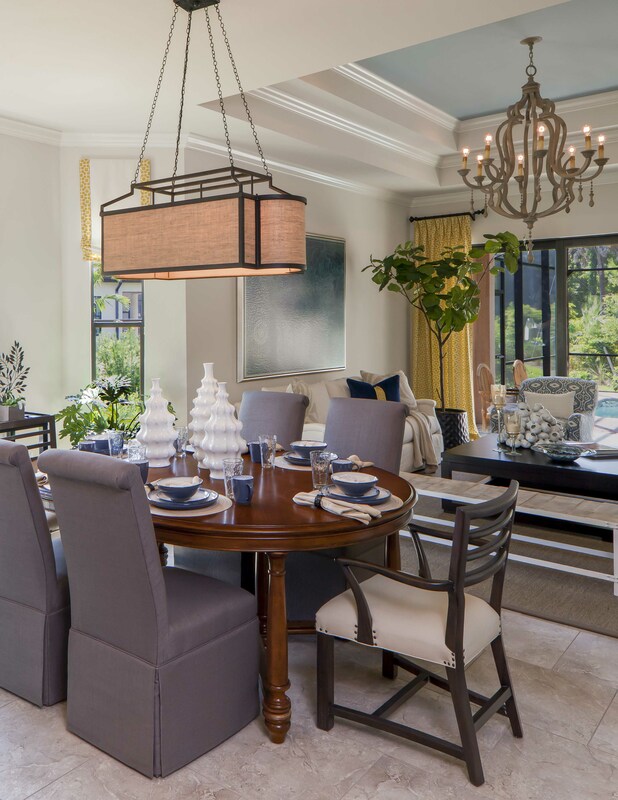 Multi-award winning design firm, Beasley & Henley Interior Design created high-impact features to entice buyers to the Napoli model home in Naples, FL for builder Stock Development. This home competes in the crowded market segment of $600,000 single family homes. 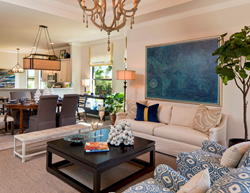 Multi-award winning design firm, Beasley & Henley Interior Design created high-impact features to entice buyers to the Napoli model home for Naples, FL builder Stock Development. The Napoli, located in the Lely Resort community, is priced in the mid $600,000, which is one of the most crowded price point segments in the busy Naples home market. Beasley and his design team were tasked with creating a stand-out interior for this 1822 sqft home, while appealing to the conservative 55yr + vacation buyer looking to retire to Florida for golf, beach and relaxation. Color- Starting with the color palette, Beasley opted for an established cream backdrop, but accompanied that with unexpected vibrant touches of blue, yellow and grey, giving this relaxed coast home exciting and non-typical selections. 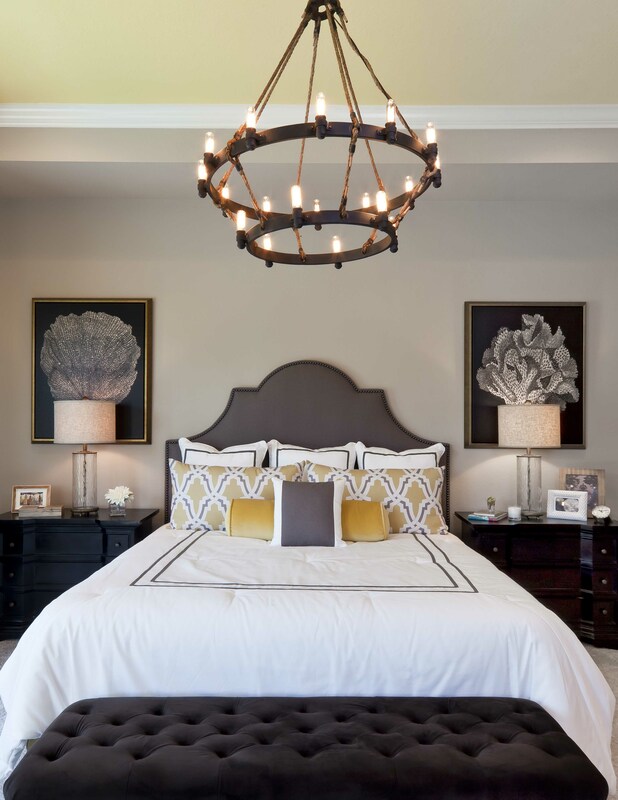 For example, Beasley design the master suite to be both comfortable and striking with bold touches of yellow and geometric fabrics. Interior Details - Beasley & Henley’s team of interior detailers created ceiling designs including impactful trays and adding crown molding which add value, but keep within the price range. They also designed cost effective built-ins for the living room and study creating an environment with a custom feel these buyers enjoy. Flooring – The open flow of the home is complimented by Beasley’s selection of soft colored limestone flooring that creates unifying continuity to this 2 bedroom/2 bath plan. Furnishings – Beasley selected clean-lined, classical furniture, adding a casual sophistication these home buyers seek. Lighting - Throughout the home the lighting is transitional and sleek providing an upscale, current feel which Beasley and the builder assessed would appeals to these buyers. Kitchen - The small kitchen is kept clean and fresh with white cabinetry and light granite countertops. Artwork and Accessories – These are key to the ambiance of the home. The design team’s lightly themed accessories and artwork add to the sophisticated, coastal flavor and make this home standout in the crowded market place. Beasley & Henley’s many award winning models with Stock Development can be found in Quail West and Lely Resort in Naples, FL. Beasley & Henley Interior Design is a boutique design firm that believes in creating innovative and memorable interior spaces, uniquely suited to our client’s needs and specific goals. With 20+years of experience in award winning luxury home, our industry leading team is composed of the best designers and staff, providing our clients with exceptional quality and exceeding their expectations. If you have questions about this project or any other, please reach us in Central Florida at 407-629-7756 or at our Naples office at 239-774-1005. 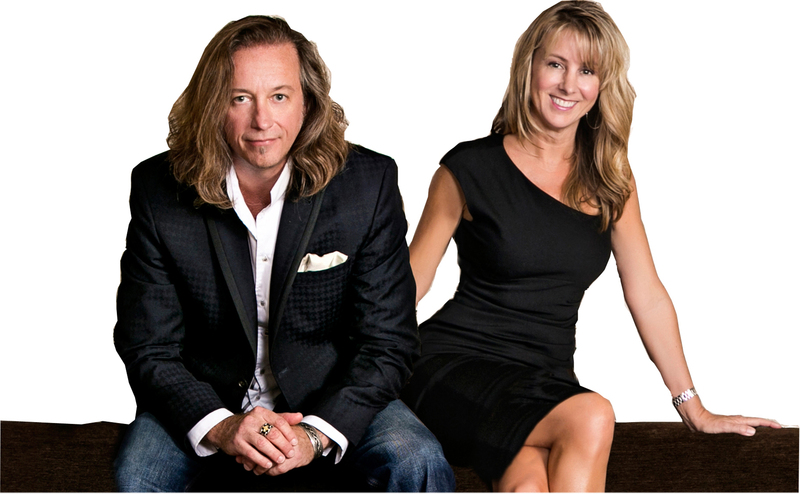 You can email us at Stephanie(at)BeasleyandHenley(dot)com or visit us on the web at http://www.BeasleyandHenley.com.